When it comes to choosing commercial vehicles, the decision used to be all about considerations such as capacity, cargo type and weight. Those factors are as important as ever, but now you also have to contend with alternative fuel sources and changing environmental regulations. Recent and forthcoming changes are likely to make diesel more expensive and electric power cheaper, too. In 2016, the government extended its subsidy for electric vehicles of up to £20,000 to trucks heavier than 3.5 tonnes, as well as to small vans. It is now consulting on moving van vehicle excise duty to being based on emissions, as it is with cars. In addition, cities are introducing low emissions zones like the one in London, where diesel vehicles face charges. Leeds will soon follow suit. He suggests a new electric vehicle may have a larger upfront cost than a diesel vehicle, but a full charge can cost as little as £3 and it is likely to hold its value much more than older, second-hand diesels, which may face increasing emissions-related costs. Renault, which offers a small electric Kangoo van and is planning to introduce an electric version of its Master panel van, says these factors mean electric power is the future for many wholesalers. “Environmental reasons, taxation and running costs will drive the adoption of electric vehicles,” says Steve Wilson, LCV range manager at Groupe Renault UK. Perfect for urban use and capable of travelling on one charge the same daily distance as most diesel vans, they are growing in use and adoption. Louise Neilson, head of business sales at Peugeot, says that the EU may require tachographs in light vans as well as HGVs, limiting drivers’ hours and mileage, which could affect the UK during Brexit. When it comes to choosing a vehicle, do not overlook the costs of additional equipment. LDV’s Laidlaw says that items such as cruise control, included as standard on his company’s vans, are not luxuries – they can help to keep fuel costs down and make the fleet more efficient. Longer warranties, inclusive roadside assistance and comprehensive servicing agreements can also help to keep costs transparent and under control, he says. Citroën has included GPS tracking system Teletrac Navman as standard on its Berlingo and Relay vans, to help drivers get to their destination on time and to recover vehicles if they are stolen. It also offers a telematics package, which can monitor driving behaviour and fuel consumption, offer customised advice to drivers on efficiency, and give servicing and maintenance alerts. Peugeot, Citroën and Renault all highlight their customisation options, making it easy to add refrigeration, freezers or easy solutions for pallet loading. Renault will even handle your sign-writing so your vehicles can be ready to hit the road without any downtime. Options abound – so assess what features most benefit your business before committing to purchase. Launched last year, the flexible large Volkswagen Crafter van – which comes in a choice of sizes, as well as front-, rear- or four-wheel drive – has already won multiple awards. With all the advantages of the versatile Partner van, the Peugeot Partner Electric is an all-electric drivetrain that slashes running costs and avoids charges in low emissions zones. The Citroën Relay can handle loads of up to 1,995kg, and Citroën offers a wide range of conversions, such as box vans, Luton vans and curtainsiders, which make pallet-loading easy. Europe’s biggest maker of electric vehicles has added a large van to the range this year, the Renault Master ZE, with a range of 124 miles and the same capacity as its diesel counterpart. “Do not separate buying your van and running your van: taking out a service and maintenance contract when you purchase the vehicle is cost-effective, especially when rolled into a monthly payment, and means you do not have to worry about regular servicing costs. “Consider also where you operate: trends towards last-mile delivery options from a single warehouse are growing, but vary from town to town, especially as new emissions legislation comes into force. “We run a fleet of 16 HGVs and we have a diverse set of products and customers that we deliver to. The important points for us are efficiency, whole-life costs and servicing costs. “The environmental impact is important, too. You need to be aware of high-emissions charges coming in if you deliver to places such as Leeds city centre or Manchester. It is about corporate social responsibility as well. We do not have any alternative-fuel vehicles yet, but they are on our radar. 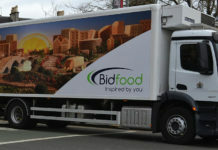 Read similar: What commercial vehicles suit your operations?